Here’s Day 9 of The St. 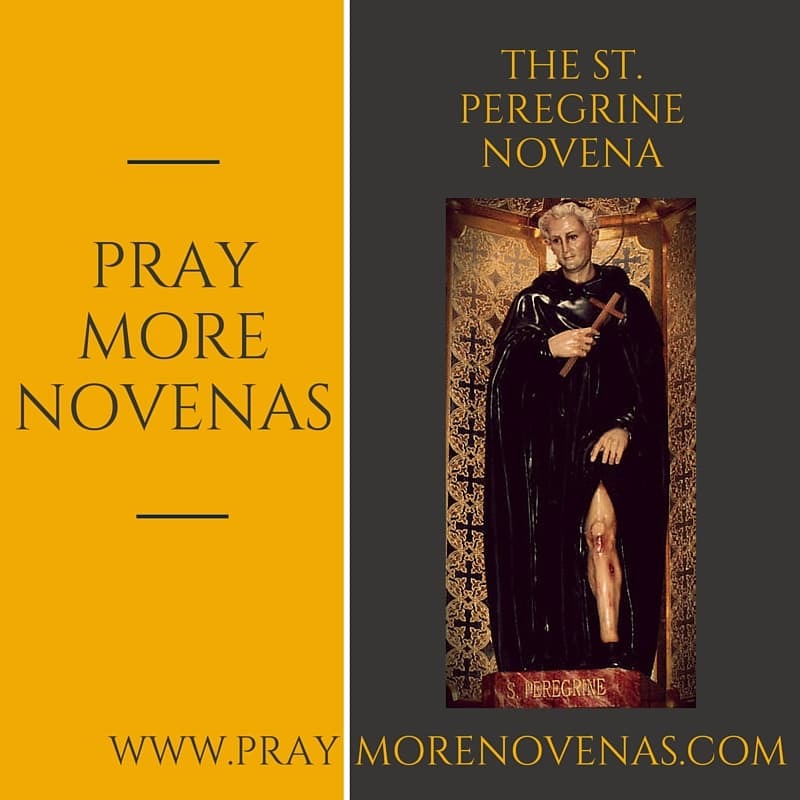 Peregrine Novena for Cancer Patients! I would like to thank the coordinator of this novena program, to be honest is makes our faith stronger and stronger, my wife is waiting for lung transplant, yeah thank God for his healing mercy on her, still thinking of positive in miracles so that the Lord will restore her strenght…continue to pray and fasting for his blessings. Thank you for prayers answered. Nathan’s 18 hour cancer surgery was successful. It was his last hope and had to travel from Michigan to Texas to have it done. Please continue to pray for his recovery. God is great! St Peregrine most Holy servant of God please intercede for my brother Charlie , cure his immune system! Remove any block that may get in the way of his spirituality. Heal also Walter his failing health of heart disease! Guide my brother to show forgiveness towards his son in Jesus Holy name. Heal Wally from all addictions through the Precious Blood of Jesus to renew his heart. May Mary’s eye be free from pain and inflammation; & if surgery is to be may the hands of the surgeon be guided by Divine intervention in Jesus Holy name.???? Please St. Peregrine heal all persons suffering from mental anguish in Jesus Holy name.????. I pray that my brother Michael who has stage 4 lung cancer will get a positive result from his scans this week that his final chance at treatment is working. May his life bring honor to God and hope to others with his healing. Dear St, Peregrine, who so courageously surrendered to God and received a miraculous healing, may you also oversee all those in need of spontaneous healings at this time so that they may become healthy, vibrant, and devoted to sharing the miraculous works of God & the healing angels. In humble gratitude, we thank you for showing us the beauty of hope and health. * I ask for special intercession for my devoted friend Elizabeth, who has always been so dedicated to the healing of others and who is now welcoming prayers for her personal health, self-love, and healing of her immune system and underlying complications. Amen. Please bring healing and peace to all who suffer. Bless their families and caregivers. Please hear and answer my special intentions. Thank you dear Saint Peregrine for hearing our prayers. Please intercede to God for us. Please ask God to heal us emotionally, spiritually and physically, and thank Him for all the graces He has given us. Please let God’s will be done for us and please ask God to continue to be there for us and to grant us the grace to accept His holy will. In Jesus’ name. Amen. St.Peregrine, please pray that I will successfully pass the 2017 Bar Exam. Please also pray for the safety and healing of my whole family especially the relationship of mommy and nanay.Amen. I am praying this Novena for a young Mom who was diagnosed with Stage 3 Breast Cancer. She has two little boys and a wonderful husband who need her. I am praying that all of the treatments that she is getting will heal her Lord. Amen.